As a mortal being, Jesus shared the human condition. He lived and died as one of us. In this way, his story is universal. But it is also unique, for it does not end with his death. In the Gospels, the presence of Jesus persists beyond the cross. The violence of the world is not able to consume him. His story is completed not with death but resurrection. But by definition, resurrection is beyond the range of common experience. It doesn’t take place within ordinary history, where just anyone can see it. The Resurrection is not the restoration of the past, a returning of Jesus’ old body to this life, but the translation of Jesus into a new reality which cannot be neutrally observed, but is only revealed to the faithful. “Things beyond our seeing, things beyond our hearing, things beyond our imagining”[iii] remain discretely offstage in the gospel narratives. The resurrection will not be televised. But some things were seen, as attested to in the gospel texts. There was an empty tomb, one or two mysterious messengers who tell them Jesus is not “here,” and a series of encounters with the risen Christ. The reports are fragmentary, and sometimes contradictory, befitting something so strange experienced by different subjects, each of them groping for language to express the inexpressible. The cinematic accounts of the Jesus story provide an interesting way to consider what can be shown or seen of the Easter event. There is an inherent literalness to whatever the camera shows us: real objects under the light. Music, editing, and other cinematic devices can add layers of interpretation, but we are still seeing actual material things, visible to anyone in their presence. [iv] How, then, can a film show us something that so radically eludes and exceeds the visible, the resurrection that is, in Rene Girard’s delicious phrase, “too real for a perception dimmed by the false transfigurations of mimetic idolatry”? In this two-part survey of resurrection stories in Jesus films from 1927 to 2014, we will look at three elements: the Resurrection itself, the empty tomb, and the appearances. Of the nearly twenty lives of Jesus produced as commercial features or television miniseries since the early twentieth century, few have attempted to represent the actual moment of resurrection. Cecil B. DeMille, always the showman, couldn’t resist giving us Jesus actually walking out of the tomb in The King of Kings (1927). The stone covering the entrance begins to glow, then falls away, and a Jesus bathed in radiance stands tall before our eyes. He looks a bit lonely, perhaps unsure of what to do next as he takes a few tentative steps back into the world of space and time. DeMille’s camera remains respectfully outside the tomb. We don’t actually see whatever happened inside. Mel Gibson, in The Passion of the Christ (2004), is bolder, placing the viewer within the sacred epicenter. As the camera pans around the tomb, we see the sunlight penetrate the darkness as the stone is rolled away, and then we see the slab where the Savior was laid. But instead of a body, we see only the shroud collapsing into flatness as the form which gave it shape apparently vanishes. If we are witnessing the moment when a a corpse is translated into something else, the facts of the matter remain discretely veiled from sight. It is a stunning and poetic moment. Not quite seeing the mystery itself, we glimpse its trace — white fabric, suddenly emptied of its content, falling gently onto a stone slab. We see what can be seen, and no more. And yet so much is implied. However, when the camera pulls back to show the naked Christ, sitting quietly on the edge of the slab as he opens his eyes, the delicate balance of the visible and invisible is broken. The image is too literal, too crudely specific for an event which shatters all language. 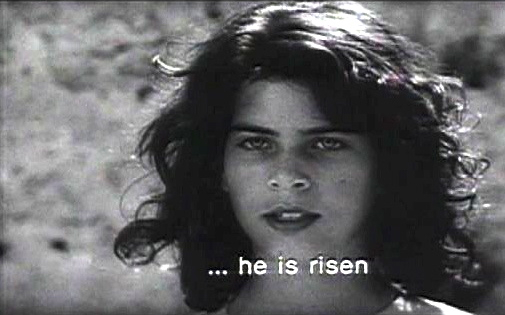 Pier Paolo Pasolini’s The Gospel According to St. Matthew (1964) presents the Resurrection with the naïve simplicity of a medieval mystery play. Soldiers doze before the sealed tomb. The mother of Jesus arrives with a few disciples, male and female. They kneel, clutching bouquets of wildflowers. Suddenly, an earthquake. The stone door falls. The tomb is empty. The camera zooms in on the abandoned shroud. We hear an exuberant African Gloria. We see a young “angel” in close-up, announcing the resurrection and sending the disciples forth to evangelize the world. Mary smiles and gives a courteous bow to the angel. Cut to the disciples, on fire with the good news, running, running, running, their faces full of joy. With the movements of their bodies compressed and blended tightly by a telephoto lens, the screen explodes with their collective energy, which becomes the perfect icon of the risen life — empowered, unconstrained, joyous and overflowing. Pasolini doesn’t worry about plausibility. He represents the Resurrection with a kind of magic realism, where the camera, in a matter-of-fact manner, gives equal weight to the natural and the supernatural. This is more like the poetry of an Easter hymn than a documentary. Instead of explanation, here is proclamation. Son of Man (2006), the South African retelling of the Jesus story in a fictional 21st-century African country, brings Jesus out of the grave twice. Instead of being crucified, Jesus is abducted and “disappeared” — beaten to death and buried in a secret grave the way so many activists were killed in South Africa under apartheid. But Jesus’ mother manages to find the grave, and a few disciples help her dig up the body and display it on a hilltop cross in a gesture of defiance, as if to say, We will not let crimes against the people be hidden. This shockingly literal crucifix inspires the disciples to risk their own lives in protest against the murderous oppressors. The sun in Spring will rise over the mountain. The voices of a choir begin to add their soaring harmonies. The man’s tall shadow is joined by shadows of the angels who have watched over Jesus since his birth, played by small boys adorned with ostrich feathers. These elongated sunrise shadows of Jesus and the angels stretch beyond the grave into an open field. It is a haunting image, hovering between the spectral and the substantial. We cut to close-ups of the boys’ angelic faces, beautiful and smiling as they look into the distance. Then we see what they see: Jesus, dressed in his familiar denim work clothes, ascending a hill. The boys, suddenly a great multitude, follow after him. This powerful final image evokes not only the host of heaven welcoming Jesus home, but also the departed souls he drew into his risen life when he descended to the dead. In contrast to the affirmative mood of the resurrection scenes, the empty tomb creates uncertainty and bewilderment. What has happened to the body? In The Greatest Story Ever Told (1965), Mary Magdalene goes to the tomb at dawn, only to find the stone rolled away from the entrance. A young man is standing just inside the shadowy cave. “He is gone,” he says. “Why seek ye the living among the dead? He is risen.” There is nothing particularly uncanny about the man’s appearance. Played by Pat Boone, he is disappointingly prosaic. Magdalene departs the tomb just as some male disciples arrive. When the men enter the tomb, the figure in white doesn’t even speak to them. He simply takes a seat at the rear of the cave like a museum guard, thinking his thoughts while the tourists have a look around. It is awkward staging, without the slightest aura of transcendence. Only the soundtrack’s “Hallelujah Chorus” tells you something religious is happening. The CBS miniseries Jesus (2000) also follows the Johannine account (John 20: 1-10), but when John joins Peter in the tomb, he has no problem grasping the situation. “He is risen!” he declares. This is faithful to the absence of any psychological processing in John 20:8 (“he saw and believed”), but on film such instant belief seems unconvincing. We need to see John thinking, as the truth sinks in. We want to experience the drama of recognition played out over time, reflecting our own wrestling with doubt as the horizon of the possible is radically expanded before us. Peter offers some token resistance (“Risen? No! The body’s stolen.”), but he soon joins John in embracing resurrection faith as though it were something easy. The problem with such scenes lies in the inherent ambiguity of the empty tomb. It does not prove resurrection. Christian claims about the meaning of the empty tomb were countered very early on by alternative explanations: the body was stolen; Jesus, not really dead, woke up and walked away; the women went to the wrong tomb; or — my personal favorite — the gardener moved the body so that the disciples wouldn’t trample the vegetables while venerating their master’s grave. The most that the empty tomb can do is prompt questions. The Resurrection is about presence, and the tomb is only absence. He is not here. Why seek the living among the dead? Still, there is something decidedly uncanny about the messenger(s) at the tomb. In Mark’s early account, the “young man in a white robe” was not yet Matthew’s dramatically embellished angel, with a face like lightning and a dazzling snow-white robe. Even so, the women who saw him were “struck with amazement.” Luke’s later text has them bow to the ground, a clear act of worship. There is something here that does not want to be explained away. The strange quality of this encounter preserves an essential trace of the divine at work. Reducing the story to whatever we call plausibility would only evacuate its power to convey a deeper truth. How, then, can the filmmaker strike us with amazement? Pat Boone won’t suffice, nor could computer wizardry, riffing on Matthew’s special effects, ever be anything more than distracting artifice. But in Franco Zeffirelli’s Jesus of Nazareth (1977), there is a compelling balance between cinema’s inherent naturalism and the gospel story’s overflowing transcendence. We see three women walking toward the tomb, escorted by a Roman guard. When the soldiers move on ahead, only the disciples are left within the frame. It is then that they hear a voice meant only for the faithful: “Where are you going? Why seek the living among the dead? Jesus is not there.” The women look up to see two gardeners on the hillside. The eerie electronic notes of a Theremin over a low percussive rumble underscore the sense of the uncanny. The women hurry on to the tomb, only to find it empty. They run back, full of questions, to where they saw the gardeners, but now the hillside is empty. Only a couple of hoes remain as tangible signs that this was more than a vision. Other than the music, everything in this scene is natural: women walking, a gardener speaking, an empty tomb, two abandoned hoes. No faces like lightning, no dazzling raiment, no echo effects on the vocal. And yet, we feel that the women, and we as well, have been touched by something wondrous, just beyond the grasp of our senses. In Part 2 (coming soon to a computer near you! ), we will examine how Jesus movies have handled the most critical element of the resurrection stories: the appearances of the risen Christ to his disciples. [iv] Of course, computer-generated imagery can show us things which do not exist in the empirical universe, but while we may be amused or awed by such effects, we are fully aware of their artificiality. It is quite a different thing to gaze at a real object, or a human face, and wonder whether there might be something there beyond the visible. This entry was posted in Anglican spirituality, Bible, Cinema, Jesus, resurrection, Theology and tagged "Things beyond our seeing" I Corinthians 2:9, Can the resurrection be represented?, How is the resurrection of Jesus depicted in movies?, John 20:1-10, Resurrection in Gospel of John movie, Resurrection in Jesus movies, Resurrection in Pasolini's Gospel According to St. Matthew movie, Resurrection in Passion of the Christ movie, Resurrection in South African Son of Man movie, Resurrection in Zeffirelli's Jesus of Nazareth movie, The empty tomb in the movies, The revolution will not be televised by jimfriedrich. Bookmark the permalink.